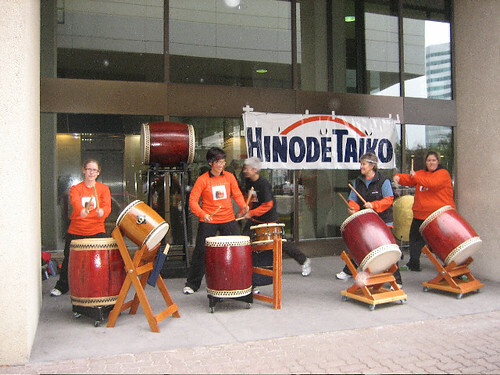 Hinode Taiko was at the CIBC Run for the Cure, Oct 4, 2009. We had a spot out of the rain for the 2009 Run for the Cure, which saw a great turnout, despite the wet weather. 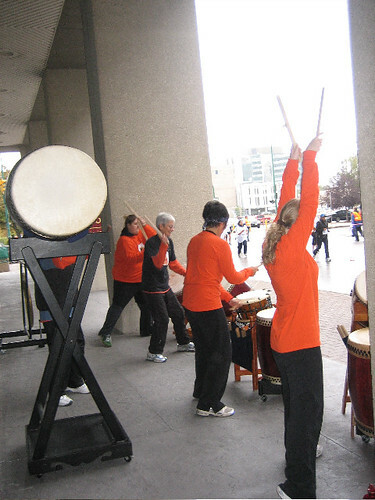 L to R Zoe, Karleen, Margaret (on Odaiko), Peggy and Dana. Run for the Cure 2009 had some wet moments but an enthusiastic crowd – so Winnipeg – showed anyway! 2009 Run for the Cure, originally uploaded by hinode taiko.